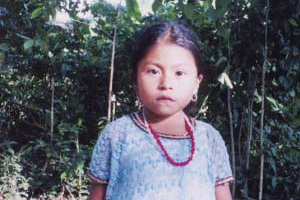 Lucia is six years old living in Cacahutal, Guatemala. She is very shy and likes best to play with her doll. Her mother told us that Lucia does not know yet what she wants to be when she grows up. But in this part of the world children have to help their families in the housework very early in life. However, there is still enough time left for playing. 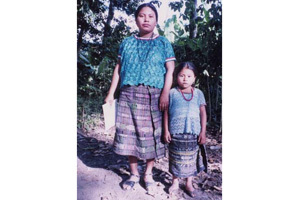 Together with her family Lucia lives in a small adobe house with its own toilet which is pretty unusual for the rural areas of Guatemala. This helps to reduce the risk of disease. However sometimes it is necessary to walk along a 15km footpath to the nearest hospital. Her father has occasional jobs and her mother is responsible for the household. Lucia attends the Primary School which is a 30 minutes walk away from her house. On her way she meets two friends and time goes by very quickly for them when talking about all those things which are interesting for little girls. Lucia is very happy to have the chance to go to school and is always looking forward to her favorite subjects. During the rainy season Lucia’s family collects as much rain water as possible. Usually it is very dry in the summertime and there is almost no chance to get water then. A coal stove is used for cooking and heating. The children and women are responsible for collecting wood. There is no electricity and therefore the family uses candles in the evening. Charity Cat consciously decided to provide this opportunity for a godchild from Guatemala as children like Lucia are still discriminated against in a lot of Latin American and South American countries.